Dec - 13 | By: Green Production | no comments. 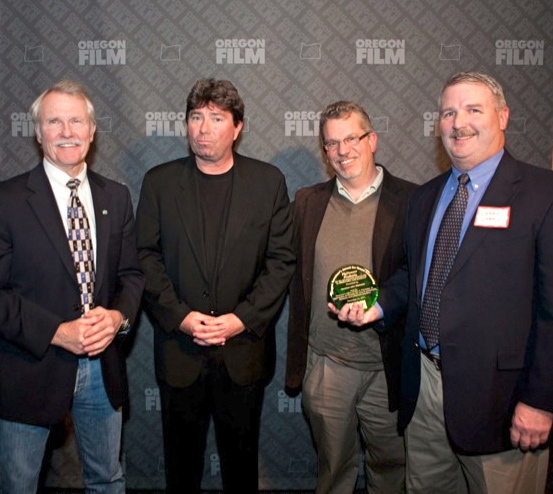 Governor Kitzhaber presented the Oregon Governor’s Award for Green Leadership to PlyVeneer Products, (for the development of ScenicPly in collaboration with EcoScenic) on Monday night at the Film Office’s public Annual Meeting in Portland. Reading the details of the award was First Lady of Oregon, Cylvia Hayes. (Cylvia is also founder of 3E Strategies, a consulting firm and green product development company.) Over two hundred industry members were present. PlyVeneer Products had some ScenicPly samples on hand that provided some keen interest. Over two years ago, working entertainment industry professionals; Garvin Eddy and Jim Jones from EcoScenic, were searching the internet for companies that were manufacturing green building products for use in set building, as an alternative to the commonly used luan plywood. 20 million square feet of luan are used per year in the industry and current estimates indicate that 70% of this wood used in the luan product is being harvested illegally from endangered forests in SE Asia. EcoScenic set out to develop an American-made, superior product that comes from legal and responsible wood sources. ScenicPly in use on set. (Photo courtesy of Ecoscenic). EcoScenic discovered PlyVeneer Products in Springfield, Oregon and formed a partnership with National Sales Manager, Jerry Gabrio. 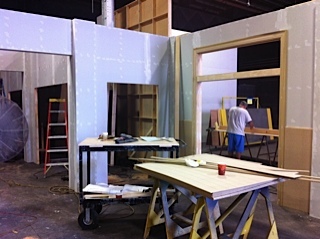 After multiple fabrications and many stage and studio tests carried out on working production sets in Los Angeles, they together developed, ScenicPly. Last month, PlyVeneer Products announced that ScenicPly had earned it’s Forest Stewardship Council (FSC) Chain of Custody certification for this American-made plywood panel, from Scientific Certification Systems, one of the world’s leading FSC certifiers and one of FSC’s founding members. FSC provides third-party certification confirming that materials sold as “FSC certified” are harvested from well-managed forest operations. Currently there are three Oregon plants involved under PlyVeneer in the manufacture of ScenicPly and two of these are currently on curtailed operational schedules. With the recent FSC certification, ScenicPly is beginning to get orders and as these increase PlyVeneer anticipates that it will be a key contributor to getting these plants back on track. Given the state of Oregon’s commitment to the green and sustainable sector, it seemed only natural that the film office find a way to promote and support eco-friendly business practices in Oregon’s film and TV industry. Some years ago the film office created a Green Resource Guide, pulling together many green vendors and services that are production related and more recently we created of the Green Leadership Award (2010) as way to honor and encourage green leadership in our state’s film and TV community. Currently NBC Universal is shooting their new show “Grimm” in the Portland Metro area. We have been able to work alongside Green Is Universal and incorporate many eco-friendly practices into this production, including the use of some ScenicPly on the “Grimm” set and we expect more exciting efforts to come. We send a hearty congratulations to PlyVeneer and EcoScenic for their contribution of ScenicPly and leading the way in sustainable business and production practices. Congratulations!